For the octopus: 1 fresh octopus (about 1.5 kg) - 1 onion 1 celery stalk - 1 carrot - 1/2 lemon - 1 bay leaf 300 ml white wine - water - course salt and pepper corns. The Roero Arneis DocgMagìa is crafted fromthe Arneis grapes of the Roero area, located on the left bank of the Tanaro river. The Roero sandy soil, which is rich in sea fossils andmarl, provides the ideal conditions to grown this white variety, which is cultivated only in south Piedmont. For the octopus: put all the ingredients in a wide pot with some water keeping the octopus aside. Bring to a boil and add the octopus; boil on low flame for 1 hour. Remove from heat, let the octopus soak in its hot stock for further 30 minutes and transfer in the fridge. For the teriyaki: put all the ingredients in a small saucepan and boil until the liquid is reduced to 1/3. For the onions: bake the onions peeled at 300 °F for 1 hour. 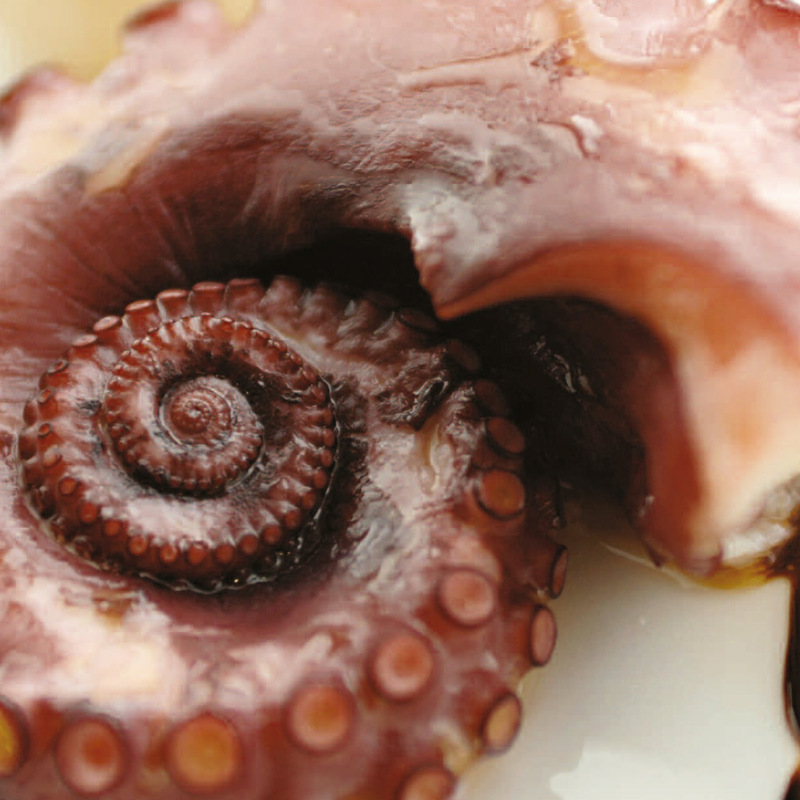 In a saltière (low-sides and thick bottom saute pan) toss the tentacles in hot oil until browned. Lower the flame, patdry the pan with kitchen paper to remove excess oil and glaze with teriyaki sauce. Arrange a tentacle and a onion in each plate and sprinkle with teriyaki sauce to finish.